As a pet parent, choosing the very best dog food for the furriest member of your family is one of the most important decisions you need to make. Selecting a formula that will meet the nutritional needs of your four-legged family member is a top priority because, just like humans, canines need to receive vital nutrients in order to thrive. While dry dog food is the most popular choice among pet owners, not all pups will accept it. Picky eaters may not like the dryness and texture of dry food, and canines that have dental health issues might have a hard time chewing kibble. For pet parents whose dogs won’t or can’t accept dry food, wet dog food is a great option. It’s softer, easier to chew, and a lot of dogs find that it’s more palatable. But there are a lot of dog food brands that offer wet formulas. While having a lot of options to choose from is nice, it can also complicate things. Trying to narrow down the countless options can be a difficult task. To help pet owners on their quest for finding the best wet dog food, we’ve extensively researched the myriad of options that are available. We’ve narrowed down the choices to what we believe are the best canned dog food formulas. What are the Benefits of Wet Dog Food? Is Wet Dog Food the Right Choice for Your Dog? Now that you’ve had a sneak peek at our top five picks for the best wet dog food, let’s take a closer look at each option. Below, we offer a more in-depth look at each formula. In each review, we highlight the ingredients that are used in each recipe, discuss what we like about each option, and share what other pet owners who have used each product had to say. Once you have read through the reviews and decided which canned dog food brand will best suit the needs of your pooch, click on the buttons to find the best prices available on Chewy and Amazon. Whether you are looking for a senior dog food, a food for large dogs, or a food for small dogs, Blue Buffalo Blue Wilderness Duck and Chicken Grill Canned Dog Food is a great option to choose. Blue Buffalo dog food is one of the most highly regarded manufacturers of pet food because they use premium ingredients in all of their formulas; and this option is no exception. This formula was inspired by wolves; the ancestors of domesticated dogs. As such, it features ingredients that your pooch would have hunted or foraged for if he lived in the wild. The first ingredient featured in this canned food is real, protein-rich beef and chicken at a higher concentration than other wet food formulas, so it will support healthy joints. It’s also a grain free dog food because it contains absolutely no corn, wheat, or soy; ingredients that ancestral dogs didn’t eat. Fortified with essential nutrients, like vitamin E, copper, B vitamins, potassium, calcium, vitamin D, and iron, this food is formulated to meet the nutritional needs of dogs of all ages, sizes, and breeds. Final Verdict: Blue Buffalo Blue Wilderness Duck & Chicken Grill Canned Dog Food is a premium quality, high protein, grain free dog food that is formulated to meet the nutritional needs of all dogs. Offering tender morsels and a palatable flavor, your pet will be sure to love this canned food. 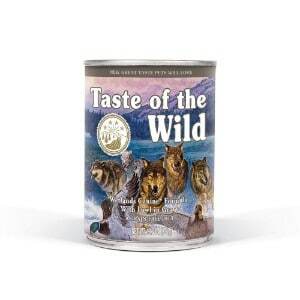 Taste of the Wild dog food is another highly regarded pet food manufacturer. The company is also based in the USA and uses the highest quality ingredients to create specially formulated recipes that meet the nutritional needs of all dogs. If you’re looking for a grain free, high protein dog food for your furry pal, this option will be sure to please both you and your pooch. Real duck is the first ingredient in this recipe. Duck is an excellent source of protein, as it offers a high amino acid profile and effectively supports the development of lean muscle mass. Other sources of protein include chicken liver, roasted quail, smoked turkey, and ocean fish, which combine to create a protein-rich formula that your canine companion will love. This recipe also includes a variety of nutritious and delicious fruits and veggies, such as potatoes, peas, tomatoes, sweet potatoes, blueberries, and raspberries. And, instead of wheat, corn, or soy, this formula features natural carbohydrates that are easy to digest, making it a great dog food for sensitive stomachs. All ingredients are combined in healthy chicken broth (for added protein), and slowly stewed to create a tender and satisfying meal. The infusion of a variety of essential nutrients, like vitamin E, amino acids, vitamin D, folic acid, vitamin A biotin, thiamine, iron, and zinc ensure your pet will receive a well-balanced meal. Final Verdict: Taste of the Wild Grain Free Real Meat Recipe Premium Wet Canned Stew Dog Food is made with premiums quality ingredients to offer your pet the nutrition that he needs to thrive. Your pup will love the flavor and the tender morsels. 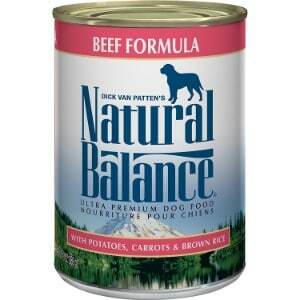 Natural Balance Ultra Premium Wet Dog Food is another canned food that’s formulated to meet the needs of dogs of all ages, sizes, and breeds. So, whether you have a puppy Doberman, an adolescent Poodle, an adult Rottweiler, or a senior French Bulldog, or if you have multiple dogs of varying breeds, sizes, and ages, this formula will suit all of their nutritional needs. The makers of Natural Balance dog food conducts nine safety tests on each and every dog treat and food that they make to ensure the utmost quality. All tests are conducted by chemists and microbiologists, so you can rest assured that your pet will be consuming the best, safest food. The first ingredient in this formula is natural beef, followed by beef broth and beef liver, which means your pooch will be getting the protein he needs to ensure his muscles are strong. Other ingredients include potatoes, carrots, brown rice, and oat bran, so it’s easy to digest. The addition of essential nutrients, such as zinc, manganese, calcium, vitamin D, vitamin A, and niacin, makes this a well-balanced meal. There are no artificial colors or flavors, and each package comes with 12 13-ounce cans of wet dog food. Final Verdict: For complete nutrition for dogs of all ages and sizes, Natural Balance Ultra Premium Wet Dog Food is an excellent choice. Our panel of experts are impressed by the ingredients, and most pet owners who use this product say that their dogs love it. 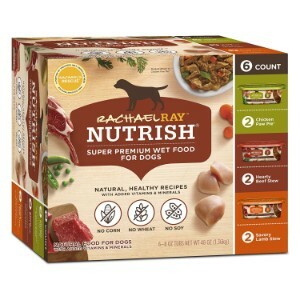 Rachel Ray Nutrish dog food is one of the most popular brands on the market; and for good reason: all products are made with premium quality ingredients and are hand-selected to ensure pets are receiving the best possible nutrition. This package of wet dog food comes with three different formulas: Chicken Muttballs, Hearty Beef Stew, and Beef Stroganwoof. Each option offers a highly palatable flavor to keep your pet happy, and since there are three different flavors in one package, you’ll be able to keep mealtime enjoyable. All formulas feature protein sourced from beef or chicken, an array of veggies, like carrots, potatoes, spinach, tomatoes, and green beans. And, all recipes are infused with essential vitamins and minerals to ensure that your pet receives the best possible nutrition to ensure optimal health. Final Verdict: Rachel Ray Nutrish Natural Wet Dog Food is made with the highest quality ingredients and specially formulated to ensure the best nutrition for dogs of all ages and sizes. Most reviews indicate that they – and their pets – love the taste. Purina dog food has long been one of the most trusted names in pet food. This company is committed to providing dogs with the very best nutrition and selects the highest quality ingredients that are packed with essential vitamins and nutrients. Tender cuts of natural chicken are featured as the first ingredient in this recipe to deliver a powerful punch of protein. Protein is the building block of strong, healthy muscles. It’s also formulated with natural sources of glucosamine, so you can rest assured that your furry best friend’s joints will be in great condition to potentially stave off issues like hip and elbow dysplasia. It also contains brown rice, so it’s easy to digest, making it a great choice for pups that have sensitive stomachs or other digestive health issues. The addition of antioxidants will help to strengthen your furry best friend’s immune system so he can fight off infections and live a healthier life. Everything is mixed together with gravy, which helps to tenderize the ingredients and offers a savory flavors that your pooch will absolutely love. In fact, most pet owners have said that their dogs’ love the taste and literally lick the bowl clean! And, since it’s free of fillers and other unhealthy ingredients that are featured in many other wet dog food formulas, you can have confidence knowing that you are feeding your pet a food that is not only delicious and nutritious, but safe, too! 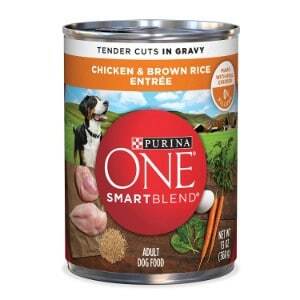 Final Verdict: Purina One Smart Blend Tender Cuts Entrée in Gravy Adult Wet Dog Food is a great option for adult dogs of all ages. It’s made with high quality ingredients and contains vitamins, minerals, and other essential nutrients that are vital for your pet’s overall health and well being. When it comes to selecting the type of wet dog food you choose to feed your pup, you want to ensure that you choose an option that offers the vitamins and minerals that he needs. Just like humans, canines require a balanced diet that is rich in essential nutrients in order to thrive. But there are so many different wet dog food brands on the market, and not all options are created equal. Unfortunately, many canned dog food formulas include fillers that offer little nutritional value, and in fact, can actually cause serious health problems. Is wet food the right choice for your pup? What should you look for when you are choosing canned food? How did we select the best wet dog food options featured in our review? In the buyer’s guide section of our review, we’ll answer these questions and more so you can make the best choice for your pooch. Easier to chew than dry kibble. For some dogs, chewing dry kibble can be difficult; puppies, senior dogs, and dogs that have oral health issues, for example. Wet food is much softer than hard, dry kibble, which makes it a lot easier to eat. More palatable. A lot of canines find that wet food just tastes better. The texture and taste more closely resembles the food that their ancestors would have eaten, so it satisfies their instinctual cravings. Dry has little to no moisture content, so it offers very little or absolutely no hydration. Wet food, on the other hand, contains moisture, so in addition to filling your pup’s belly, it will also nourish his system with additional hydration for improved overall health. Higher protein content. Some dogs, like puppies and those that are genetically predisposed to joint health issues, require a high protein diet. Canned food offers a lot more protein than dry food, as it contains less grains and more meat. Protein is packed with amino acids, which are the building blocks of tissues and muscles, so wet food can help to strength and support strong joints and stave off musculoskeletal issues. Additionally, protein also plays a part in healthy skin and hair, so feeding your pup canned food can also help to clear up skin problems and make his coat more lustrous. Difficulty with dry kibble. If your pet has a hard time chewing dry food – whether it’s because he has oral health issues, like missing teeth, or because his mouth is too small – then wet food is likely the better choice. Refuses dry food. If your dog is finicky and you’ve tried various types of dry food, then you might want to think about offering him wet food instead. As mentioned, canned food more closely resembles the food that your domesticated dog’s ancestors consumed, so he might find the texture and taste more appealing than the texture and flavor of dry food. Requires more protein. If your veterinarian has suggested a high protein diet for your pet, then canned food might be a better choice. As we discussed above, canned food has a higher protein content than dry food, which means that he’ll be able to get the protein that he needs to thrive. Real animal protein. 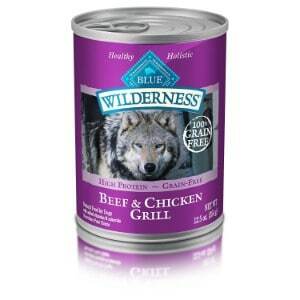 Premium quality canned food will feature protein that has been sourced from real animals as the primary ingredients. Read the list of ingredients; if you don’t see a specific animal listed as one of the first three ingredients, keep on shopping. Real vegetables and fruits. The best wet dog food brands also feature a blend of real fruits and vegetables. These ingredients improve the nutritional content of the food, as they contain essential vitamins and minerals. They improve the flavor, too. Whole grains. Whole grains, like oats and brown rice, offer more nutrition than corn, wheat, or soy. They are also easier to digest than gluten-based ingredients, so make sure that the formula you choose contains whole grains. Fortified with nutrients. The best canned dog food is fortified with essential vitamins and minerals to further ensure that your pet is receiving the best possible nutrition. Whether your pet has difficulty chewing, is a picky eater, or has specific nutritional needs, feeding him wet dog food might be a better option than dry food. If you do decide to feed your pooch canned food, make sure that you read the label and select a formula that contains premium quality ingredients, like those listed above. All of the wet dog food brands listed in our review contain natural ingredients and are specifically formulated to meet the unique nutritional needs of canines of all sizes, ages, and breeds.